Rus Peotter is a vice president of the WGBH Educational Foundation, Boston and General Manager for WGBY, Springfield; Public Television for Western New England. He and his family moved to western Massachusetts from Maine in 2001. 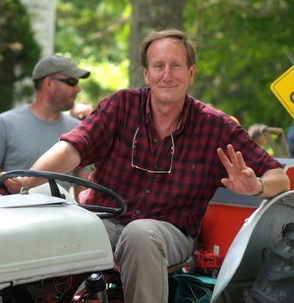 Rus began his career doing TV production in Maine where he conceived or produced many arts programs and projects from live broadcast of the Maine Festival in the 1980s to the award-winning AIDA Project in Springfield in 2003. He serves on many community organizations and Boards including; Old Sturbridge Village, The American Red Cross, Community Involved in Sustaining Agriculture (CISA), the Greater Northampton Chamber of Commerce and The Trustees of Reservations. Rus has a lifetime relationship with the arts and believes deeply that art and culture are not only essential to a full life, but also to a successful society. He lives in Chesterfield with his wife Jennifer, his step-daughter Rachel, his son Alden, over 30 chickens, 7 goats, 2 horses, a crazy Weimaraner and a 71-year-old Ford tractor. In addition to loving his family and the arts, he is also fond of food, wine, canoeing, fly-fishing and cross-country skiing. He is a registered Maine Guide.